The Seattle/Tacoma Kimono Club is planning our first meet-up at the upcoming kimono show, The Tradition and Culture of Kimono. Our Facebook event listing can be found here. 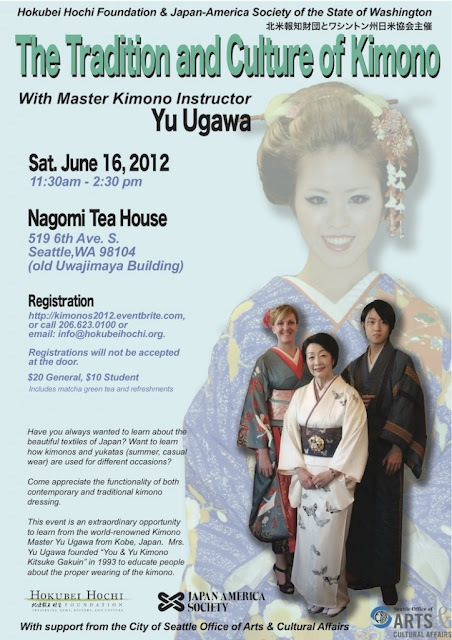 Kimono master, Yu Ugawa will be demonstrating kimono and yukata dressing and preparation, and sharing the history and culture of kimono. Registration is required. $20, $10 for students. Please register as soon as you can as tickets are expected to sell out. You can purchase your tickets here. Wearing kimono to the show is NOT required, however, you may wear kimono or yukata if you wish to do so. This is a great opportunity to learn more about kimono from a master.